When it first premiered, Agents of S.H.I.E.L.D. was a television spinoff from the larger Marvel Cinematic Universe - specifically from the events of The Avengers, which featured the death of S.H.I.E.L.D. agent Phil Coulson (Clark Gregg) as a rallying point for the superhero team. In the first season that Agents of S.H.I.E.L.D. was on ABC, the series featured tie-in episodes with MCU films Thor: The Dark World and Captain America: The Winter Soldier, the latter of which had a major impact on the Marvel TV show. Ever since the tie-in episode with The Winter Soldier - which saw the dismantling of the S.H.I.E.L.D. organization and established Hydra as their main foe - Agents of S.H.I.E.L.D. has been largely plotting its own course. In season 2, the series began diving into Inhumans (individuals created by the alien Kree race who receive powers after undergoing Terrigenesis), and season 3 has further explored the impact of Inhumans popping up all around the world. Additionally, season 3 of Agents of S.H.I.E.L.D. has been building up to the events of Captain America: Civil War with the formation of the Advanced Threat Containment Unit (ATCU) and the general public attitude toward powered individuals like the Inhumans - and the Avengers. Now, Agents of S.H.I.E.L.D. has aired its first episode after Captain America: Civil War, titled 'Emancipation,' which wastes no time in reminding viewers that #ItsAllConnected in the MCU. 'Emancipation' opens with Coulson and Melinda May (Ming-Na Wen) discussing the recent events of Captain America: Civil War in a bar playing a WHIH Newsfront report on the unknown whereabouts of Steve Rogers after his dispute with Tony Stark. Additionally, WHIH Newsfront reports the registration and monitoring of all enhanced individuals under the newly established Sokovia Accords. As May points out, needing to register Inhumans with the government will hinder the missions of S.H.I.E.L.D., which has been operating in the shadows since the events of The Winter Soldier. In response to the report, Coulson mentions that Captain America was his hero growing up - a character trait that has been well-established in both The Avengers and on Agents of S.H.I.E.L.D. recently with Coulson's Cap-inspired S.H.I.E.L.D. shield. Plus, Coulson is reading a newspaper that contains an article on the death of Agent Peggy Carter, whose funeral Steve Rogers attended in Captain America: Civil War. Lastly, May leaves the bar just prior to Glenn Talbot's (Adrian Pasdar) arrival, when he questions Coulson about the number of undocumented Inhumans in S.H.I.E.L.D. Talbot and Coulson argue about whether S.H.I.E.L.D. is able to operate to the best of its ability with or without government oversight. As was the case with Steve Rogers, Coulson is wary of government oversight - both were betrayed by the organization that they trusted, afterall. However, though Coulson and Talbot go back and forth on whether S.H.I.E.L.D. will register its Inhuman agents, no agreement is reached in 'Emancipation' as the threat of Hive takes precedence. 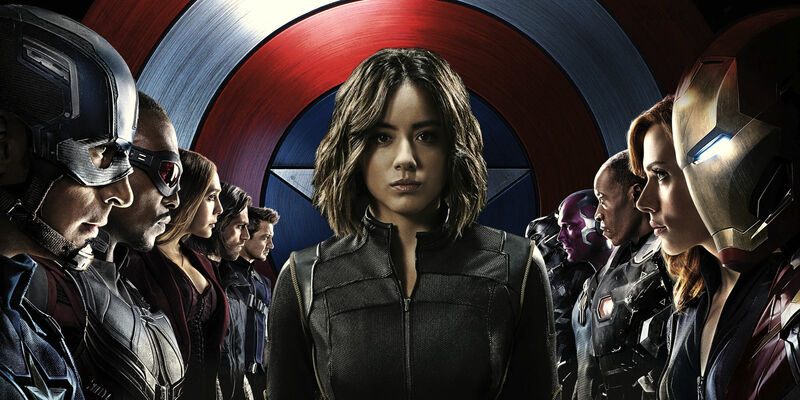 Unlike previous tie-in episodes with Agents of S.H.I.E.L.D., 'Emancipation' doesn't sacrifice the ongoing storyline of the season for the sake of a one-off episode tracking down an alien artifact, as was the case with Thor: The Dark World, or going in a completely new direction, such as after The Winter Soldier. Instead, the introduction of the Sokovia Accords into the world of Agents of S.H.I.E.L.D. fits perfectly since the series has been establishing exactly the kind of fear and paranoia - as Hive explained in 'Failed Experiments' - that would lead to governments demanding control and oversight over enhanced individuals (perhaps even more so than the film side of the MCU). In fact, Agents of S.H.I.E.L.D. uses the Sokovia Accords to further develop Coulson's organization as a team that needs to operate without government oversight, as he says, "Don't report our Inhumans, some battles need to be fought with secret warriors." This statement is one of the most obvious references to the Secret Warriors storyline that has been the inspiration for much of season 3, and showcases the theme of vigilantes versus superheroes that has been prevalent in all aspects of the MCU. Certainly, there are obvious ties to Captain America: Civil War in 'Emancipation' that reference specific events or universe-changing legislation established in the film. But, on the whole, Agents of S.H.I.E.L.D. has been laying the groundwork for the world's attitude toward enhanced individuals all along. The impact of Captain America: Civil War will only help the series to continue exploring the theme of what must be done, and how far heroes should go, in order to save the world. Next: Where Does Captain America: Civil War Leave the Avengers? Agents of S.H.I.E.L.D. season 3 concludes with ‘Absolution/Ascension' Tuesday May 17th at 9pm on ABC.